We're not sure what's happened with Vincent and his family after MITIE's gaff on the roof of Farrer that caused one of his ceilings to collapse onto his young daughter while she slept in her bed. But their flat was not the only one affected. Yesterday, one of his neighbours at the other end of the block was hit on the head by a piece of falling plaster from the ceiling in her toilet. The whole of the ceiling and wooden supports are rotten and AJ can see the loft insulation through the hole. Apparently, the flat next door is in an even worse state. The fire officers attending the roof flood at Farrer House in the early hours of 27th October stated that all the fibreglass insulation in the exposed roof area was soaked, was unlikely to dry out properly and would probably need replacing. What has happened since? 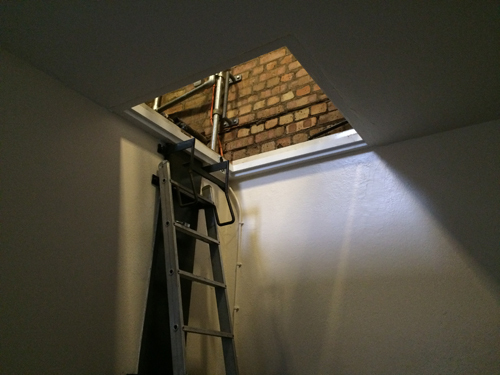 On 3rd November, the access door to the loft was open and a worker was overheard chatting in a foreign language on his phone in the pitched roof area...was he fixing things? And, though nothing to do with the roof, a pipe was leaking and soaking a wall...just one of the many examples of MITIE's shoddy work and Lewisham Homes' poor management. AJ already had a hole in her kitchen ceiling from roof work that took place prior to the flood. 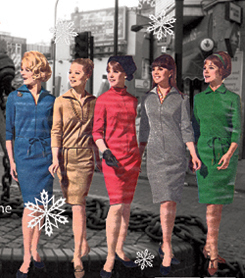 MITIE had made an appointment to visit her flat about that damage but hadn't kept it. 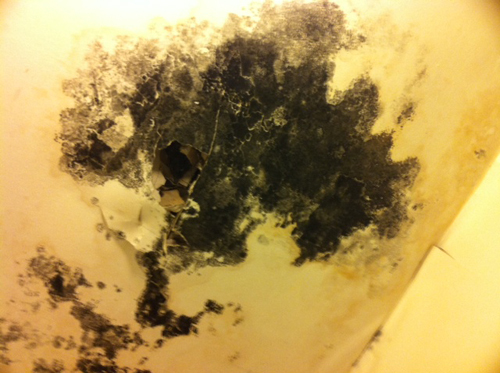 By 12th November, AJ's toilet ceiling was beginning to grow mould. But all that had happened after the flood was a brief visit from the MITIE site supervisor the following morning. And a letter went out to Farrer residents from MITIE, apologising for the roof leak. 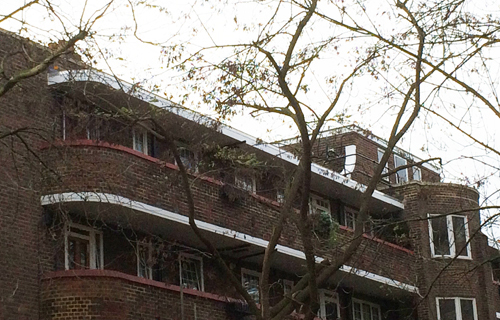 By 18th November, no one from Lewisham Homes had made contact and no interior repairs had taken place. Yet astonishingly, on 2nd December, AJ was invited (as the 'block representative') by the Lewisham Homes Major Works Project Manager to attend a walkabout on 16th December (with Lewisham Homes surveyors Baily Garner) to "sign off" – or "handover" – all of MITIE's 'completed work' on Farrer House. 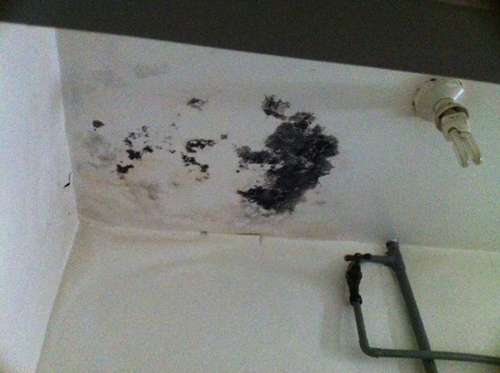 How can work be signed off when ceilings are rotting? On 7th December, when a gentle tap with a broom handle indicated her toilet ceiling was liable to collapse at any time, AJ chased the Project Manager yet again and questioned whether a "handover" was really appropriate. If anyone was going to be working up there, a misplaced foot would bring the whole lot down, she warned. She emailed again when it started falling in on her head the next day. The reply she got was even more incredible. The Major Works Project Manager replied that MITIE had been asked to provide the reports of their "pre-condition inspections" carried out before work began, and that "it was evident from MITIE's photos that the ceilings were already in a poor state of repair". In other words, MITIE was claiming that the damage had not been caused by their failing to protect the roof repairs, and Lewisham Homes appeared to be agreeing with them. AJ was astonished, as her ceiling had been more or less fine before the flooding. The Project Manager continued, "Following the roof leak, MITIE submitted a report of the damage, having visited the properties in question last week". But they had made no such visit to AJ. Not in any particular hurry, the Project Manager said she would have a look for herself when she and Baily Garner came to do the "handover" next week. She added that "Leaseholders are insured by their building insurance". Over many years, AJ had made several claims on her own insurance for damage to walls and ceilings caused by water penetration. 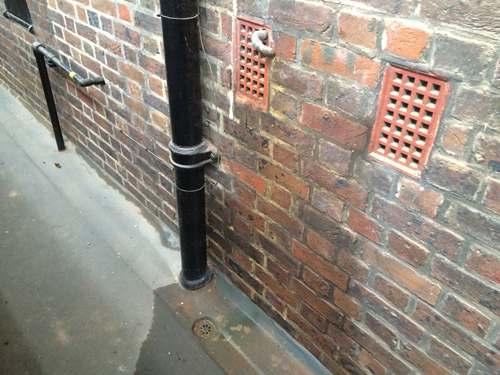 Damp was being caused by the leaking flat roof and the canopy that covers the top floor walkways which leaked where it met the walls of the flats. Only Farrer's roof is designed like this, being the last building to be constructed on Crossfields in 1949 – other top floor walkways are covered by pitched roofs. 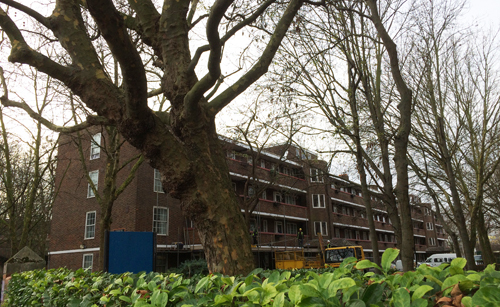 During this time, the freeholder, Lewisham Council, has only ever made temporary repairs by patching or by clearing the flat roof's drainage gullies of leaves. Leaseholders pay a contribution in their annual service charges to a buildings insurance policy taken out by Lewisham Homes which covers damage to the overall building and its communal parts. Leaseholders must also get their own building insurance to cover any damage they might be responsible for to the flats below or above them. 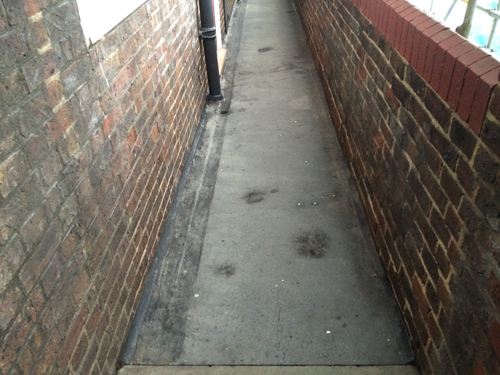 "the cause of the problem – the worn out flat roof – does not seem to have been addressed. 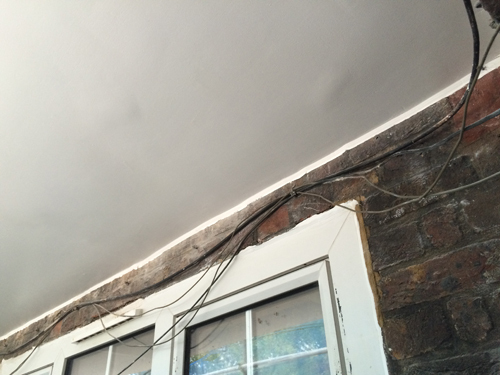 The insurers would now regard any further damage to Ms (AJ)'s property as being inevitable due to lack of repair. Patch repairs would appear to be ineffective and a new roof is required. Lots of paperwork seems to have disappeared during the Council's handover to Lewisham Homes in 2007, including repair records and details of previous Major Works to Crossfields in 1997. Nevertheless, Lewisham Homes recruited many of its staff from previous Council departments, and the Housing staff should have known the position on insurance. When Major Works began on Farrer last year and the roof was surveyed, AJ pointed out the problem with the walkway canopy which was sagging even then. Within days of commencing work at Farrer, MITIE painted the walkway canopy's ceiling. Water stains appeared soon after. On other blocks, the walkway ceilings were painted after "concrete repair" work had taken place – cracks were dug out around metal joists, the joists painted with anti-rust, the lot filled in and painted over. These concrete repairs were done to avoid all possibility of balcony walkways ever collapsing on people's heads. 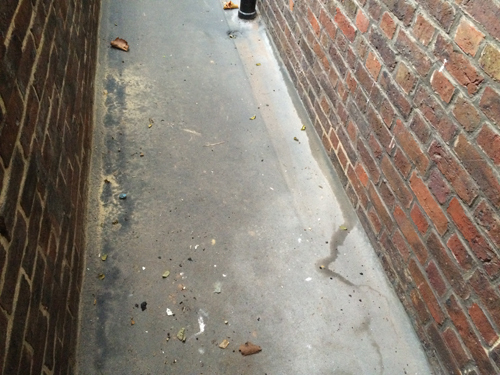 Later on, when the subcontractor arrived on site to resurface everyone's balcony walkways, the flat part of the roof at Farrer was given a coating of the same waterproofing product. Eventually, with all work supposedly completed, the scaffolding on the entire block was taken down. Then almost immediately and at enormous cost, scaffolding was re-erected to address the walkway canopy problem, which the surveyors Baily Garner had finally decided had to be completely demolished and rebuilt. 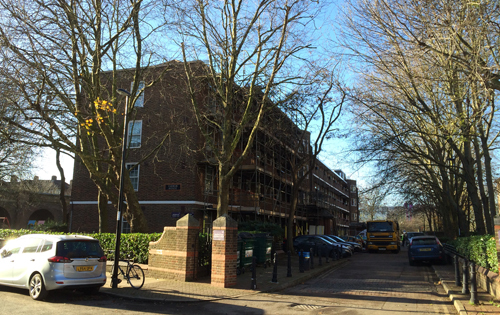 This work should have been anticipated at the beginning, during the surveys, or before estimates were even issued to leaseholders months earlier in May 2014. The requirement for such extensive structural repairs might have been picked up if anyone had ever actually bothered to look at the repair logs for the 8 year period since Lewisham Homes had been in charge. So the omnishambles that is Lewisham Homes Major Works continues, despite MITIE having been given the push. MITIE are effectively saying most of the damage was already caused by Lewisham Homes' failure to repair, whilst seemingly failing to acknowledge it has been made significantly worse by their own neglect. Meanwhile Lewisham Homes were happy to pass to the leaseholder the responsibility for interior repairs necessitated by their own neglect to properly repair the structural fabric of the building. 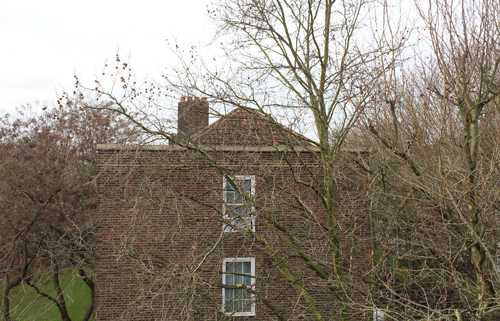 When AJ mentioned legal proceedings, the Project Manager revised Lewisham Homes' position, declaring that they were responsible for repairing the roof and that they would "make an informed decision on how damage to individual property can be remedied". No urgency, no mention of when. No word about renewing the loft insulation. In the meantime, some of the rooms in the top floor flats are almost uninhabitable. But that's OK. If someone is hurt, Lewisham Homes is liable. Today, the second lot of scaffolding (which was erected for rebuilding the previously undiagnosed walkway canopy as well as tile repairs to the pitched roof) was being taken down. With access to the roof now removed, it will be impossible to examine those roof repairs at the "handover" next week. It is likely that Baily Garner have already been up to have a look and signed it off anyway and the walkabout next week is just a formality, or even, as with other handovers, a bit of a sham. For AJ, there will be no reassurance that the problems have been solved. That's why she nipped up there yesterday to have a quick look for herself before the scaffold was struck. She was worried by what she saw in a relatively small area and short space of time – blocked gullies, large poolings of water on unevenly laid waterproofed surfaces, big gaps between the pitched roof tiling and brickwork...and had the walkway canopy actually been rebuilt? Still, when it all fails the next time, at least Lewisham Homes will not be asking her to claim on her own insurance to pay for the repairs. It only took 20 years to get that far. 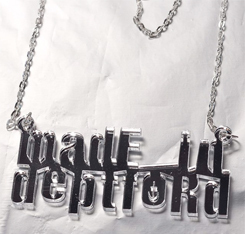 Unique handcrafted presents including ceramics, vintage clothes, classy items, jewellery, decorations, art keepsakes, Deptford 'Sunshine State' t-shirts, Deptford Is Forever anchor shirts & bags, The Lenox Project and Deptford X merchandise. 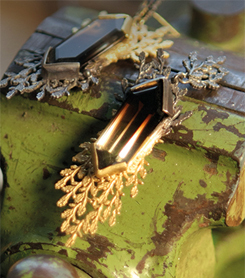 Meet makers and buy direct from designers in their studios. 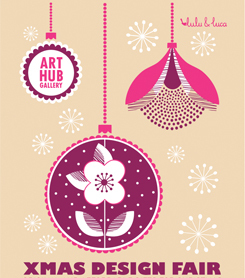 Quality textiles, homewares, jewellery, chocolates, Prize Draw for handmade Xmas decorations, Hand Made Food Café. 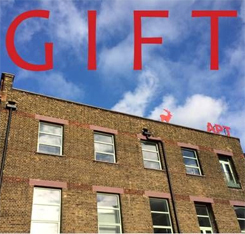 Large selection of drawings, prints, paintings, ceramics and sculpture by APT members and guests. Refreshments served! 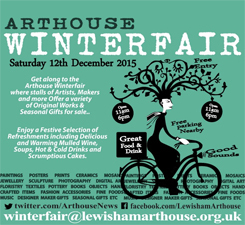 Apologies to any other Deptford fairs we've missed out!